You may be familiar with the Southern Italian dish melanzane parmigiana which uses eggplant / aubergine. I am having a love hate relationship with aubergine at present. I think it has to do with the fact that for the past 6 months or so I have been buying baby aubergines. They look very pretty but I think the skin to flesh ratio is just not right for me. I don’t like the texture of the skin unless it is in a caponata and I prefer the texture of the flesh when made into a baba ganoush. I tried making a melanzane parmigiana and after the first bite I decided I would make the dish again using fennel instead. Fennel and tomato is a match made in heaven and I loved the texture that the fennel had when cooked in this way. I know a lot of people do not like the aniseed / licorice taste of fennel but I am slightly addicted to it. My go to spice is star anise so knowing that, I should have known that I would love the fennel parmigiana. You can make this like I did in small cocottes for individual portions, or you could make a large dish to serve as a side. Either way, I am sure you will enjoy my version of this classic dish. are you a fan of fennel? Your fennel sounds great cooked this way. I have had it roasted with cheese but not the tomatoes. I shall have to try is roasted next time! I tend to go back and forth on whether or not I like fennel..but covered in cheese, I think I could become a hard and fast fan! This will convert you for sure! I love the taste of fennel in pasta and pizza. This looks delicious. I am definitely a fan of fennel. I have got to-got to- get on this fennel bandwagon…this recipe is inspiring! Looks like a really tasty dish, Tandy. I’m not a big fennel user, but I imagine it’s great in this recipe. This looks terrific. I am a huge fennel fan! I love fennel. My favourite way to cook it is to simply braise it in a little chicken stock and then sprinkle in some parmesan at the end although I did make a delicious fennel gratin the other day too. Your fennel dish looks amazing. One for me to try. And your favourite way is a dish I must try! Great idea! I love parmigiana but Big Man is not so keen on aubergines but we both love that anis flavour of fennel. Does it become tender when cooked for only 20 mins? Ouzo I can give a miss as well! 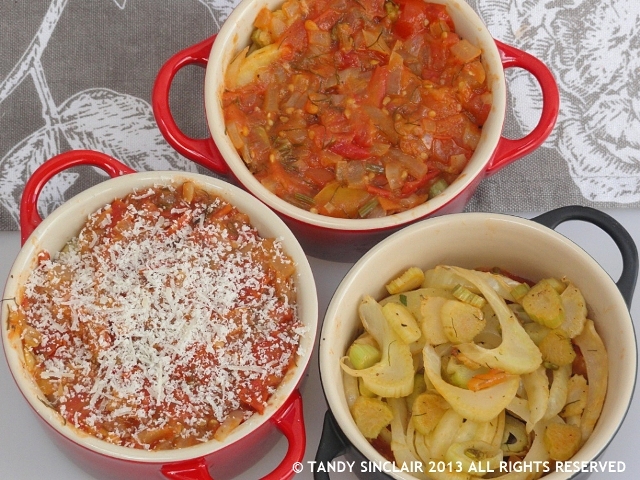 Interesting – I’ve never had fennel baked with tomato before, only as a gratin which is also good. I do like fennel but never see it in the shops out our way. i used to love it in salads when I was working in Italy. It grows wild in the Western Cape so it might be something you can grow at home? Very good idea. I’m very keen on fennel too. I love fennel and use it in salads: thin slices of raw fennel matched with grapefruit filets, roasted pine nuts – delicious! I love this recipe and fennel is on the shopping list for tomorrow. Love eggplant too and have used both large and small: had never thought of the skin/flesh ratio, but think I agree with you: I normally do keep the skin on. It took me a long time to ‘like’ fennel because of its specific taste: now very much like it in fennel/orange/mint etc salads, braises and stirfries. Have never even thought to make it your way but can’t wait to try!!! !